The longlist for the 20th annual Baileys Women's Prize for Fiction includes five debut novels and an author nominated for her 20th book. 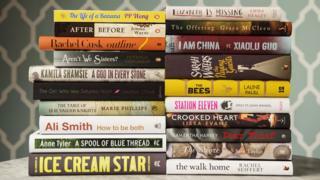 Ali Smith, Sarah Waters, Rachel Cusk, Samantha Harvey and Xiaolu Guo are among the eight authors who have been shortlisted for the prize previously. Chair of the judges, Shami Chakrabarti, said this year was "particularly strong" for women's fiction. The shortlist will be revealed on 13 April, with the winner named on 3 June. Previous winners include Eimear McBride's A Girl is a Half-formed Thing, Zadie Smith for On Beauty, Lionel Shriver's We Need to Talk About Kevin and Andrea Levy for Small Island. The prize celebrates "excellence, originality and accessibility" and any woman writing in English, whatever her nationality or country of residence, is eligible. Ali Smith's novel How to Be Both was previously shortlisted for the Man Booker and Folio prizes. The book has already won the Costa Book Award's novel category and the Goldsmiths Prize for original fiction. Also on the list is Emma Healey's Elizabeth is Missing - the winner of the Costa Book Award's best first novel. US author Anne Tyler is nominated for her 20th novel, A Spool of Blue Thread, while this year's shortlisted debut novels include The Life of a Banana by PP Wong, Jemma Wayne's After Before and Sara Taylor's The Shore. The Paying Guests by Sarah Waters, Patricia Ferguson's Aren't We Sisters?, Grace McCleen's The Offering and Kamila Shamsie's A God in Every Stone also make the longlist. This year's judges include the prize's first winner Helen Dumore, Channel 4 News's Cathy Newman, columnist and broadcaster Grace Dent and Laura Bates, who founded The Everyday Sexism Project. "All judges fought hard for their favourites and the result is a 2015 list of 20 to be proud of," said Ms Chakrabarti. The prize was set up in 1996 and was previously called the Orange Prize. The winner will receive a cheque for £30,000 as well a limited edition bronze trophy known as a Bessie, created by artist Grizel Niven. Patricia Ferguson - Aren't We Sisters?